NYC Summers can be brutal on the face. Between, smog, grime, free radicals, pigeon poo that glow can become just ick in no time. I have discovered a new product that will make you run to your nearest drugstore to stockpile. Pond's Wet Cleansing Towelettes have been my summer beauty savior. Your probably like what is so amazing about these face wipes in comparison to all others- right? First of all each individual towelette is like your own wash cloth. When I first took it out of the pack, I was like damn this is heavy. The reason for its density is that its double ply, diamond weaved and packed with all the goodies for your face; Vitamin E and Chamomile. With it's density you can really get all the gunk off your face unlike traditional thinner face wipes. To top it off, the next morning I woke up and my skin looked super dewy which I gave into a good night but after reviewing the ingredients I saw green, white and honeybush tea all amazing tea extracts being used and recommended ingredients by beauty experts. Since it's Pond's you know it's fab and frugal at around $5 bucks for a pack of 30 you can't go wrong and won't have a problem adding that to your beauty budget. 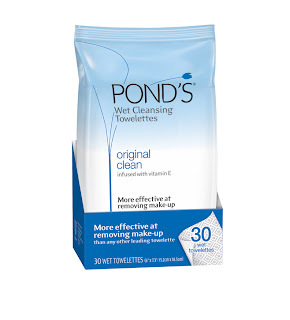 You can click here to read more on Pond's Wet Cleansing Towelettes and see a few other products that they have as well. I swear by them and you need to scoop these up and start giving great face!